Did you know that each of the nine inpatient units at Providence Care Hospital have a 5,000 square foot courtyard? These courtyards have raised flower beds, shade pergolas and seating areas for patients, clients, families, staff and visitors. With the summer weather upon us, a group of staff and patients at Providence Care Hospital are making the most of their outdoor space. 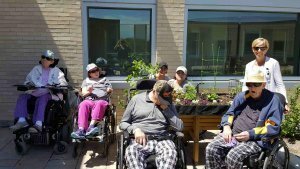 The gardening group began as part of the OT Cognitive Stimulation Group; however, OTA/PTA Gina Millen noticed right away that the group has also helped patients practice their fine and gross motor skills. “It is so rewarding to see what they have done”, she said. In fact, on June 16 some of these patients were able to enjoy the fruits of their labour; they went outside to the garden, picked and washed some lettuce, and prepared a fresh summer salad that they ate for lunch that day. One of the patients commented how calming it is to garden and to enjoy the outdoor spaces right on the unit. In addition to lettuce, the patients have helped to plant spinach, kale, cucumbers, tomatoes, dill and basil.